May 19 is a big day for me, and Medusa’s Muse. Two big events in my life are happening on the same weekend, and I’m both excited and a tad stressed out. 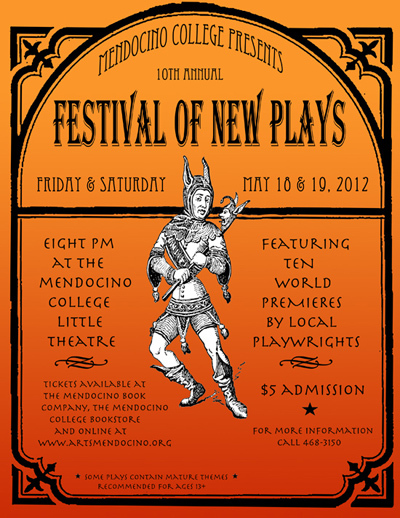 First, the 10th Annual Festival of New Plays at Mendocino College opens on May 18th, with a second performance on the 19th. The festival showcases nine Ten Minute plays and my comedy, The Wedding Party, was chosen to be one. The director who chose my play is young, which I think helps her “get” the characters so well. She’s really good, and the cast is excellent! I’m really excited to see it performed (while also dreading sitting in the audience watching their reactions, which could be good or bad). Here’s a link to Ukiah Daily Journal about the festival, with a description of all the plays. You can also see my description of The Wedding Party by clicking Writing on this blog. The other exciting thing happening that weekend is also at Mendocino College: LitFest. Click the link to see all the excellent teachers, authors, and classes at this FREE event. I’ll be teaching my class, Framing the Dream, at 2:00. Be sure and sign-up now as the class fills up fast (click the Classes link on this blog for more info on the class). I saw the countdown to LitFest on my blog and had a mini-freak out. How did the time sneak up on me like that? I have materials to update and the power-point to finish. Between my teaching job and the end of the school year madness that involves, and my sick kid, I’ll probably be working on LitFest at midnight after I’ve seen the debut of my play. And I stil don’t know what to wear.